Somehow this blog post got lost in the shuffle, so it is a few weeks after the fact. On the day of convening the week-long gathering of several dozen members of the Professional Refinishers Group in August 2011, the months-long drought took its toll. The creek above the dam dried up for the first time in memory. Ironically the local hydrology left me clueless at the bottom of the mountain; because I have several springs between the hydro turbine and the dam, the water flow coming down the creek seemed unchanged. I had been anticipating this problem as the water flow, and hence the power output, and been steadily declining through the year of 2011. 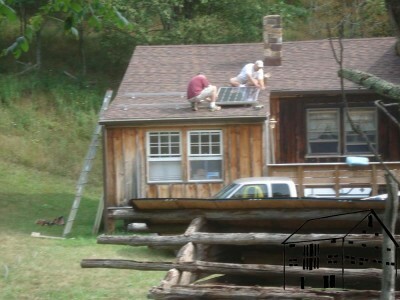 To mitigate this problem I ordered three solar panels from my friend Rich at NoOutage.com. The day before the Group convening I took delivery of a bank of solar panels, and the attendant electronic hardware to control them and integrate them into my system. Unfortunately I did not have time to install them before the throng descended. That was exceedingly unfortunate. There was barely enough electricity for the event to proceed, fortunately we did not use much power as it was mostly low-tech demonstrations and lots of tale-swapping and tip-sharing. For those times when power was needed – a PowerPoint presentation, and some formulation requiring heated materials, for example, I just fired up a little generator. The event unfolded all right, but it was embarrassing, to say the least. During that week some of the participants volunteered to stay afterwards and help me install the new solar panels and hardware, and I remain eternally thankful to SteveB, JeromeB, and BillR for pitching in to help. 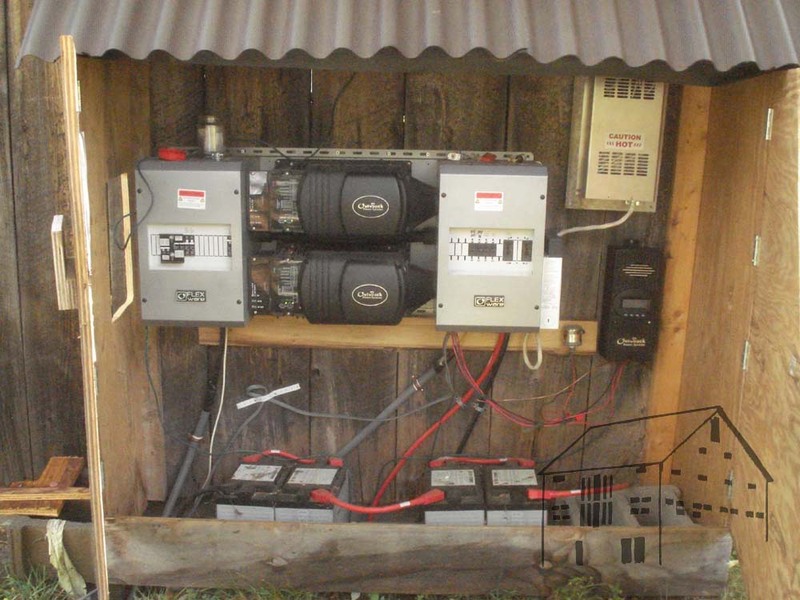 The new hardware consisted of three 235-watt solar panels, their roof mounting hardware, and the charge controller (the small black box on the right side of the power house) that would allow them to feed into the existing system. SteveB and JeromeB jumped up onto the roof for that portion of the project and proved themselves to be skillful practitioners of the problem solving arts. 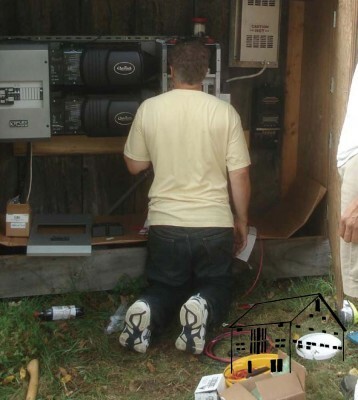 BillR is an electrical engineer, so he and I worked on the hooking up of the new panels to the old system. Once again, BillR’s knowledge and problem solving skills saved the day, and by the morning of the second day he had everything humming along. 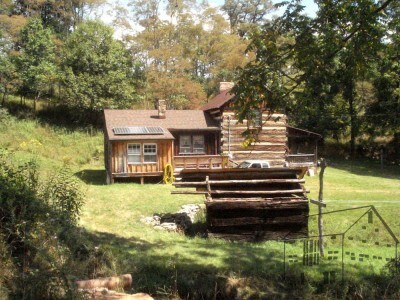 The output of the solar panels was nothing short of astounding. At noon on a sunny August day they were each producing almost 290 watts of power! Bewildered I called Rich, who told me that the ratings for solar panels had to be estimated for the output at the halfway-point of the panel’s effective life. In other words, since these are thirty-year panels, the manufacturer expects them to produce 235 watts under direct full sun in fifteen years after their installation. In the following picture, the solar component of the system is providing 79.2 volts of power at 7.7 amps, for a total input to the batteries of 609 watts. Notwithstanding our location in the mountains, where the weather can change frequently (I have witnessed five rainstorm and bright sunshine cycles in a single day), these panels have been a boon to me. They pound out power during daylight, even when it is overcast. 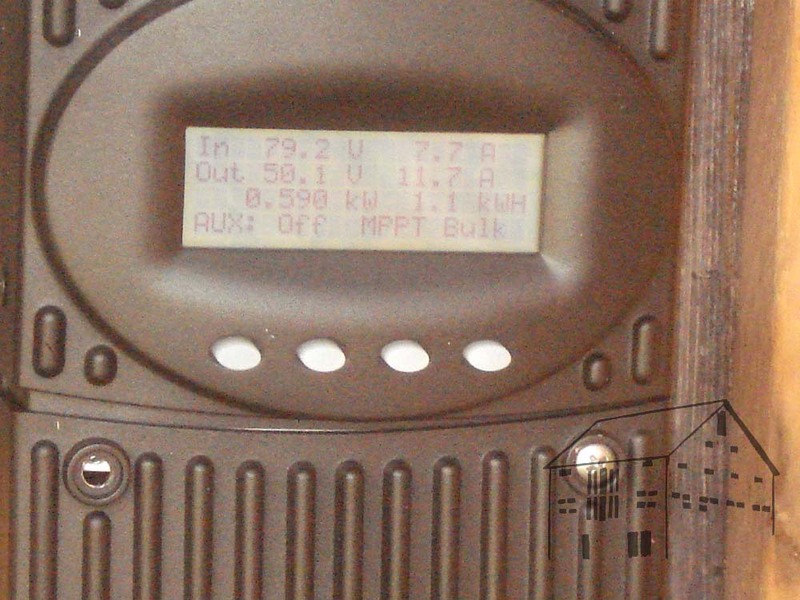 Not 290, or even 235 watts, but a couple of kilowatt hours each day even when it is raining. On a sunny day like today, they probably produce five or six kilowatt hours. In addition, the natural cycle of the weather has provided us with a wet and cool summer, so the water is flowing more freely this September than any of the previous 13. Still, I felt the need to upgrade our system further, and am embarking on that journey now.